The most exciting aspect of travel for us is the discovery of new things. We always research before we travel and like to have an idea of what to expect, but the most remarkable experiences are often the ones we weren’t expecting. Discovering Vivegan Sushi was a bit serendipitous, it occurred when we were reading about an upcoming BAM (Buenos Aires Market) and tracking back comments and commenters when we eventually noticed a ‘like’ for Vivegan. 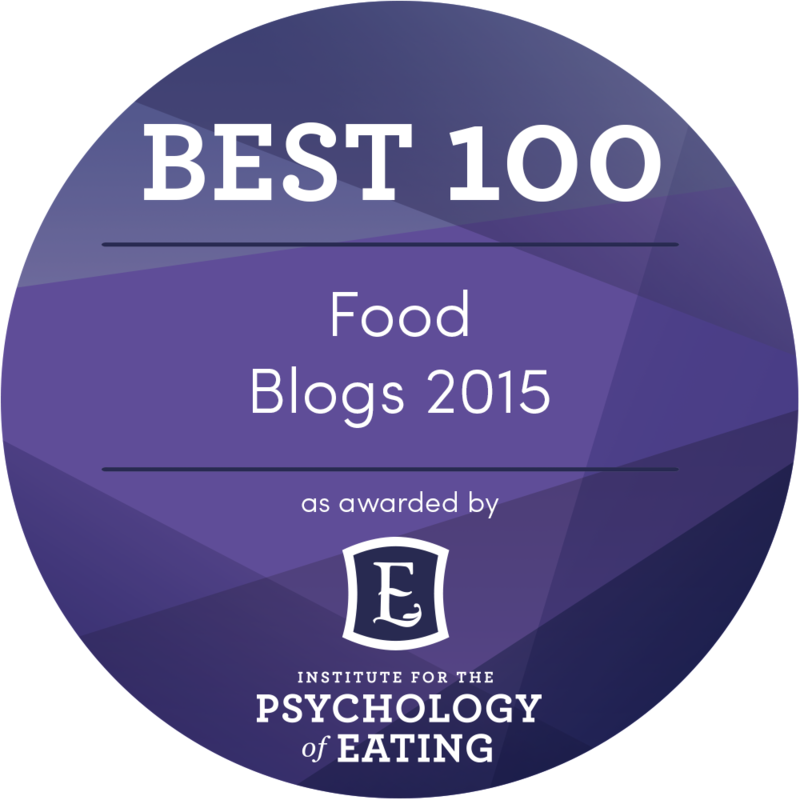 It wasn’t on a search engine, Happy Cow, blogs or any other vegan directories when we discovered it. 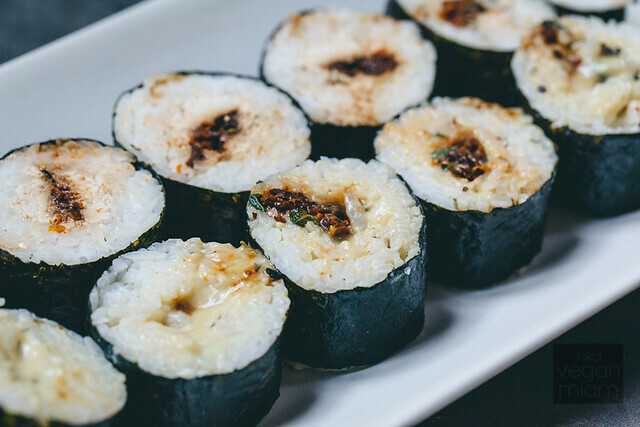 Apparently, Vivegan Sushi is the first 100% vegan sushi company in Buenos Aires and we are honored to share the news here. Lastly, but certainly not least, the owners Carolina and Gastón are so sweet, kind, helpful and friendly, plus they are both VEGANS! In addition, feel free to read our other older posts on Buenos Aires; we were there from September to November 2013. As of October 2013, Vivegan Sushi has nine different flavors including few condiments (view the menu here). 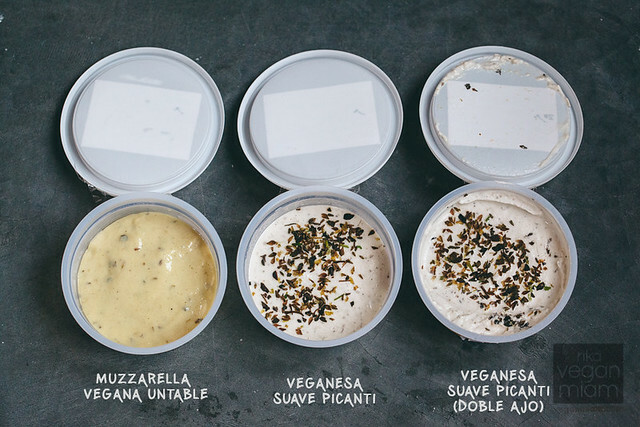 We’ve tried almost all of the flavors and the condiments; we absolutely love the Veganesa Suave Picanti (Doble Ajo), aka vegan double garlic mayo. 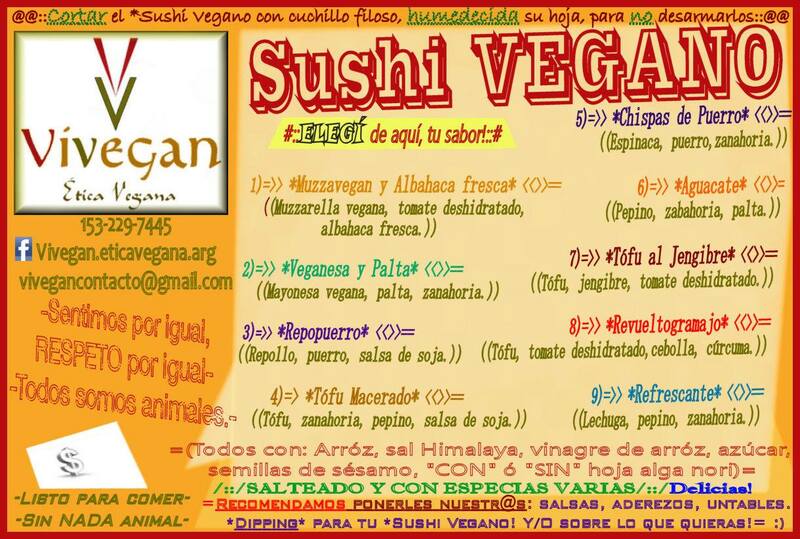 Please contact Carolina at vivegancontacto(at)gmail.com to view their current sushi list and frequent promotional offers. Please note, they are all in Spanish. All sauces keep at least five days in the fridge. They come in a 140g or 250g container with a lid. 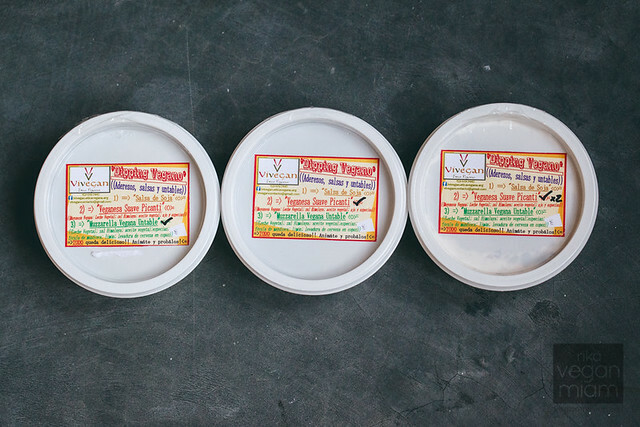 Muzzarella Vegana Untable contains plant milk, Himalayan salt, vegetable oil, spices, tapioca starch, lemon, and nutritional yeast flakes. 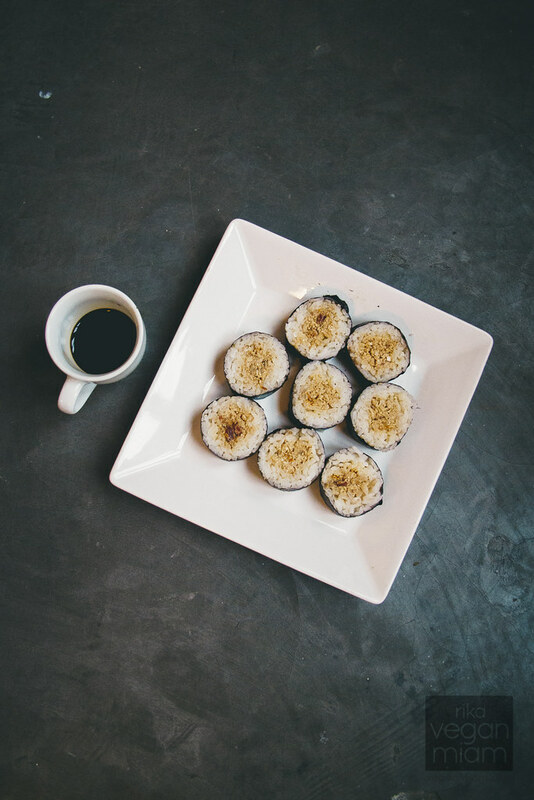 This gooey yellow sauce tastes amazing and it serves as a perfect sushi filling, but not the condiment itself (once it sits in the fridge for more than a day, it produces a slight moisture and can be overly gooey). For example, Sushi #1 (‘Mozzarella’ & Fresh Basil) was the best and unique one we’ve ever had with their sauce, basil and sun-dried tomatoes. 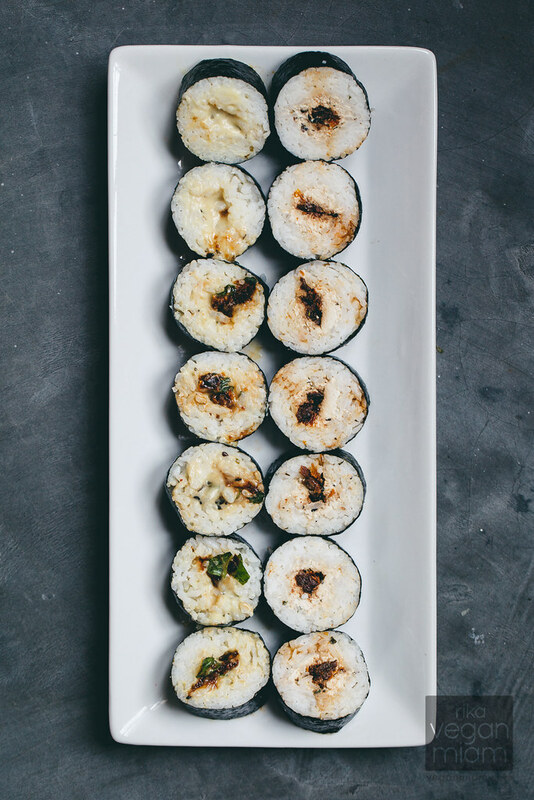 We would like to see more sushi rolls with Muzzarella Vegana Untable and other ingredients as a filling. 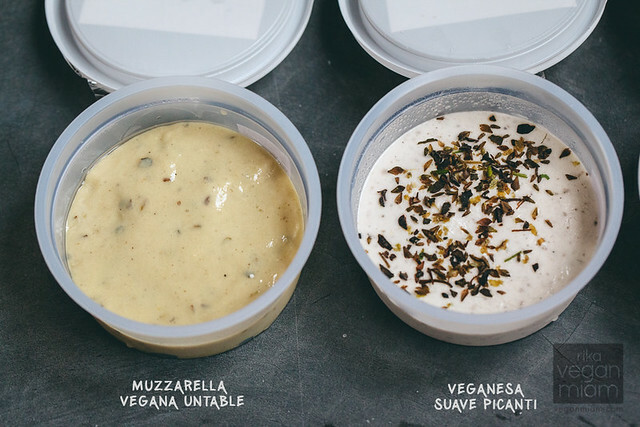 Veganesa Suave Picanti contains plant milk, Himalayan salt, vegetable oil, garlic and spices. We prefer the Doble Ajo (double garlic) one, which has more flavors. 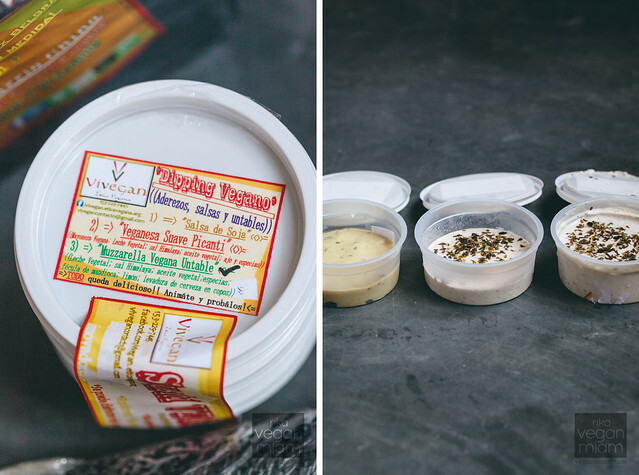 Veganesa Suave Picanti contains plant milk, Himalayan salt, vegetable oil, garlic and spices. This one contains more garlic. This was the best condiment ever. It was creamy with a very rich garlicky flavor and dried herbs and spices. Double Miam for Vivegan Sushi! 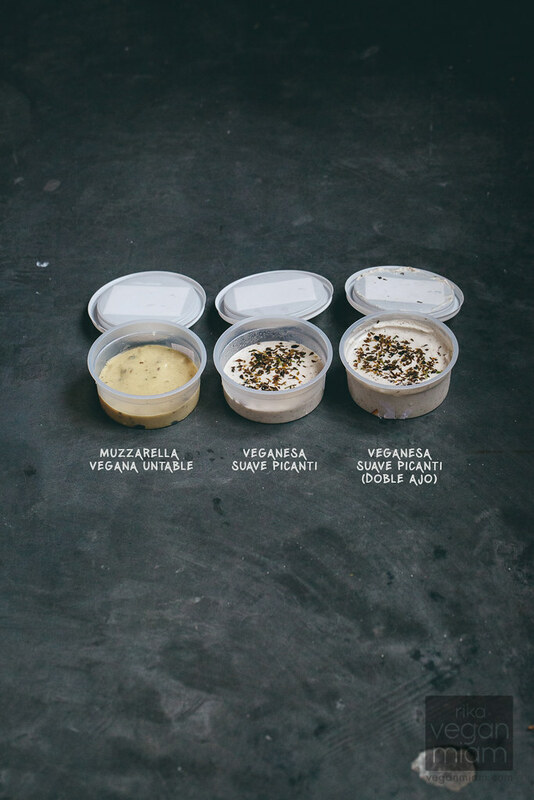 Pictured on the left is Sushi #1 Muzzavegan y Albahaca Fresca, consisting of vegan ‘mozzarella’ sauce, fresh basil and sun-dried tomatoes. It was our favorite with a slight basil aftertaste, and the vegan ‘mozzarella’ sauce was delicious in the sushi, yet a bit messy to cut due to the delectable creamy and cheesy flavor! We used soy sauce as our main condiment. It’s pretty nice to have fresh herbs in your sushi! Pictured on the right is Sushi #6 Tofu al Jengibre, consisting of tofu, ginger and sun-dried tomatoes. It goes well with any condiments – the mozzarella sauce, standard mayo, double garlic mayo and soy sauce. The ginger is only slightly present in this one, at least to my taste. The flavor of sun-dried tomatoes is quite intense, but delicious. I’ve never had sun-dried tomatoes in my sushi before, so that was something new. What are we thinking?! 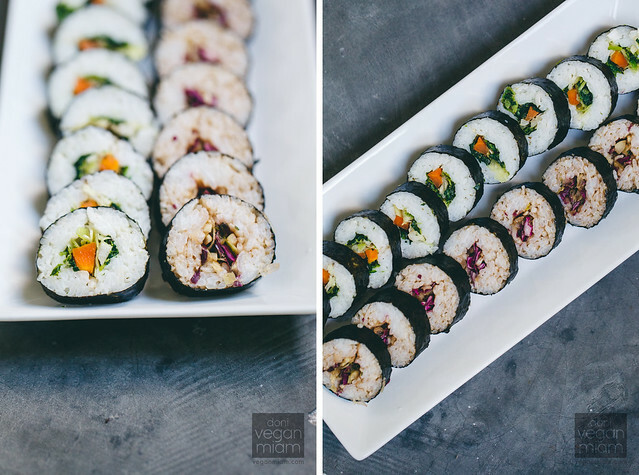 Taking a photo of two very similar sushi rolls?! Hehe! That evening we ordered four sushi rolls and randomly chose two to try and photograph, so they just happened. 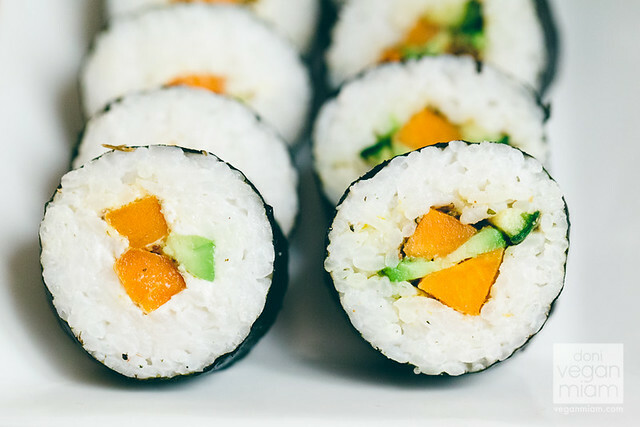 Both sushi rolls have avocado and carrots, except for vegan mayo in Veganesa y Palta (Vegan Mayo and Avocado) and cucumber in Aguacate (Avocado). We prefer the creamy Veganesa y Palta (Vegan Mayo and Avocado) with vegan mayo and the carrots provide a crunchy texture. We prefer a little bit more avocado in our fillings. Both of the sushi rolls go well with soy sauce. It was the day before Halloween in Buenos Aires. We stopped by Belgrano, a northern barrio of the city of Buenos Aires; it’s also about 15-minute drive from Palermo neighborhood depending on the traffic. That’s where vegan food exists, and of course, Chinatown, known as the Barrio Chino. We found Vivegan sushi at Asia Oriental Supermercado on Mendoza 1650 (Belgrano), and Revueltogramajo (Scrambled Tofu) was one of the last few. It was Wednesday and the vegan sushi was picked over! 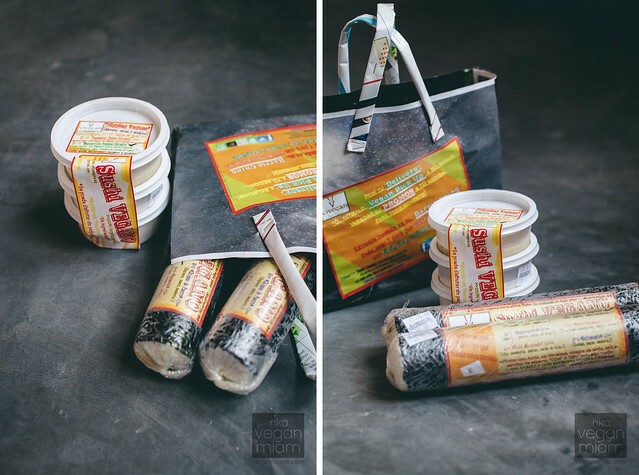 In my experience, Vivegan Sushi usually restock on Friday evenings, so check them out on the weekends. Back to the topic, Revueltogramajo (Scrambled Tofu) has tofu, sun-dried tomatoes, onions, and turmeric. The name presents two words in Spanish: Revuelto and Gramajo, which is also a Latin American dish consisting of “eggs”, thin matchstick fries, onions and other ingredients. The filling reminds me of a vegan ‘tuna’ salad, but drier with scrambled tofu & sun-dried tomatoes. The flavor works best with more than one condiment: double garlic mayo and soy sauce. Both sushi rolls have leeks and you can smell the sautéed leeks immediately, which reminds me how much I truly love my leeks in Paris. Pictured on the left is Sushi #5 Chispas de Puerro (Leeks), consisting of spinach, leek and carrots. You will need double garlic mayo with the flavor. Pictured on the right is Sushi #3: Repopuerro (Red Cabbage and Leeks). The filling has red cabbage, leeks and soy sauce. You don’t need soy sauce to go with it since it already has soy sauce. I recommend pairing it with double garlic mayo. 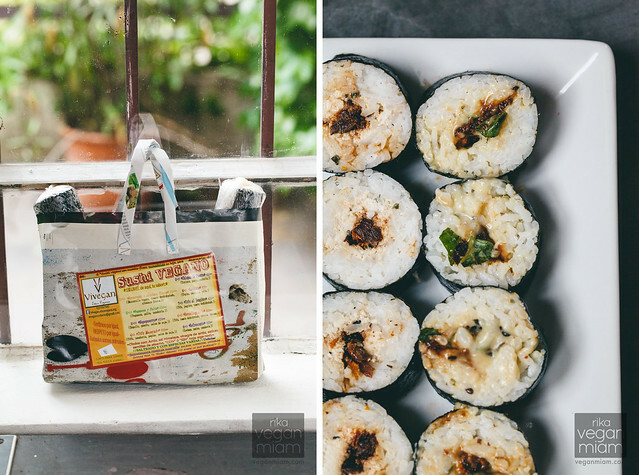 Run by a lovely vegan couple Carolina and Gastón, two passionate animal activists, Vivegan is the first vegan sushi company in Buenos Aires. They believe in compassion and empathy for all regardless of age, gender, race, sexual orientation, or species. 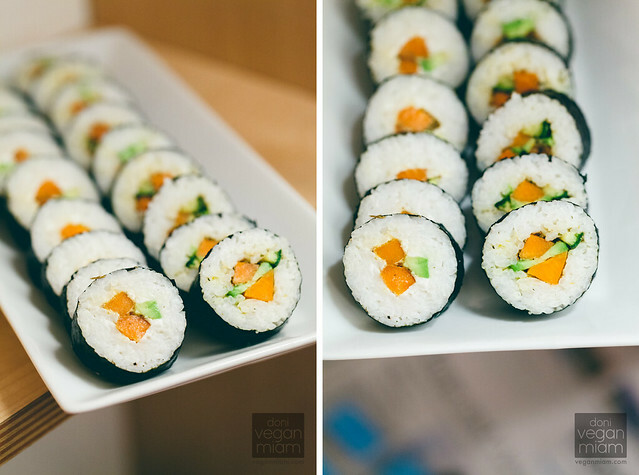 Vivegan’s mission is to offer delicious and convenient vegan sushi in Buenos Aires and promote compassionate eating. Sentimos por igual, respeto por igual! Somos todos individuos sintientes! Y de manera resumida, así es como nace “Vivegan. Ética Vegana”! 1. Contact them in advance to set up a delivery. In my experience (October 2013), they deliver on Friday & weekend evenings. Please contact them again to confirm. One of the owners Carolina understands some written English, so it’s ok to write in English to her. 2. Stop by ‘Asia Oriental Supermercado’ on Mendoza 1650 in Barrio Chino (Belgrano). In my experience, Vivegan Sushi restock on Friday evenings, so it’s best to check them out on the weekend. For example, the sushi was picked over on Wednesday I was there. To call cell phones from the United States, dial the international access code (011) followed by the country code (54), Argentina’s cell phone code (9), the area code without the initial 0, then the seven- or eight-digit cell phone number without the initial 15. 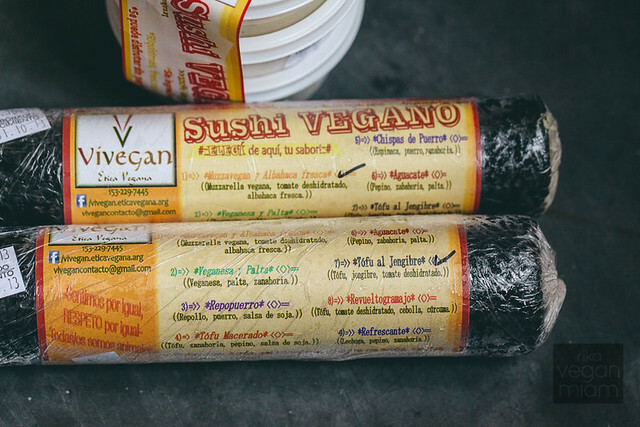 Which sushi and condiment would you like to try from Vivegan Sushi? 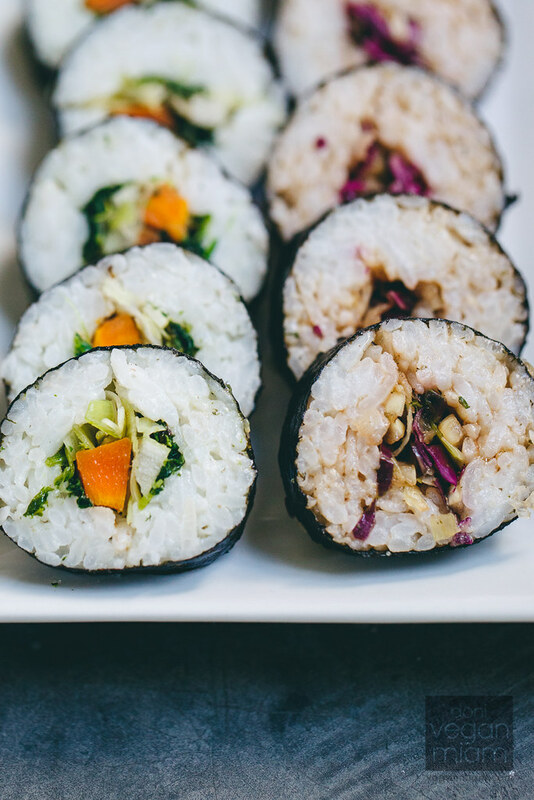 What is your favorite vegan sushi filling?